Accurate catalyst evaluation is an important step in optimizing catalytic processes with respect to product yield, energy efficiency and overall product quality. Historically, the performance of heterogeneous catalysts is evaluated using large reactor systems which typically vary between 20 to 300 ml. Reactors of smaller scale are usually more ideal in terms of heat flow and hydrodynamics compared to larger reactors and therefore provide data that is intrinsically easier to translate to a larger (industrial) operating scale. Small scale parallel fixed bed reactor systems designed for catalyst intake up to 1 ml, have been developed at Avantium in order to enhance catalyst development and selection for refinery applications. In recent years, there has been a clear trend towards small laboratory reactors. Parallel testing allows for replication – determination of statistical significance of results obtained – and for simply evaluating more catalyst options at the same time (side-by-side). In addition, smaller volumes will reduce the amount of feed required avoiding the typical issues associated with obtaining large quantities like handling, shipping and storage (for longer term availability of reference feed material). Catalyst suppliers own and use several of our Flowrence® small scale systems to maintain a continuous effort in catalyst development and stay ahead of their competitors in an ever changing landscape of refinery operations. The performance and reproducibility of 6 hydrocracking catalysts were tested in the Flowrence® micro-pilot plant under commercial conditions using 16 parallel reactors. These 6 different catalysts were loaded in duplicates and triplicates in order to test reproducibility and obtain absolute performance data. The catalysts were loaded in the presence of diluent particles in order to avoid catalyst bypassing and to ensure plug flow conditions. Hydrocracking of a doped VGO (60% above 600°F) was carried out under commercial conditions [ 650-850°F; 150 bar; LHSV = 0.5-4 h-1; Gas/Oil 300-1500; Catalyst loading = 0.6 ml (whole extrudates) ]. 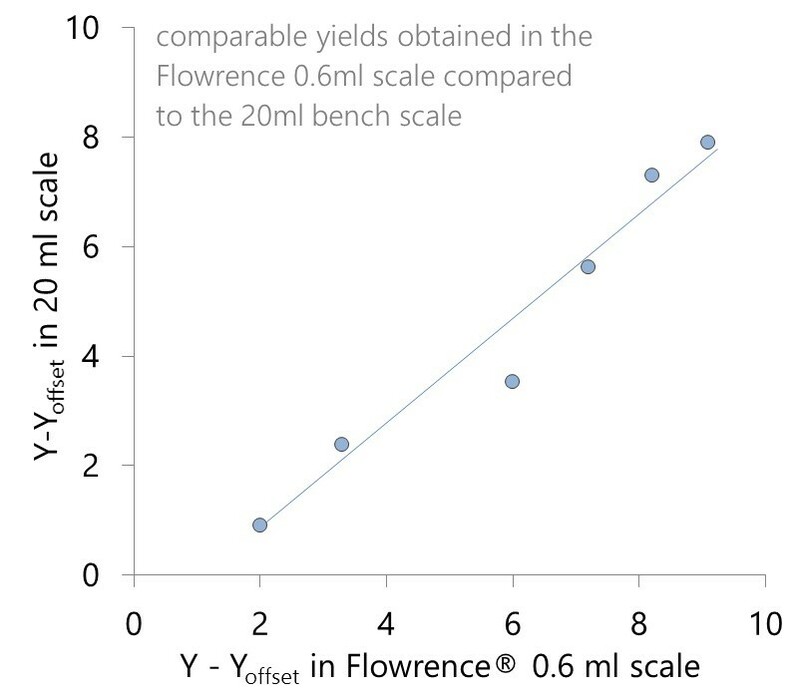 The Flowrence® reactor systems operating with catalyst volumes of 0.5-1.0 ml have a proven scalability for larger scale reactors, in both catalyst ranking and absolute values of activity and yield trends. Scalability; the results obtained in our small-scale reactor testing system for hydrocracking showed a good relation with measurements obtained in 20 ml bench scale unit from a major vendor. Reproducibility; as the catalyst packing in our small-scale reactor is straightforward, and does not require any special procedures, excellent reactor-to-reactor repeatability is obtained. This is demonstrated by a <2°F deviation between duplicate reactors for the temperature required to achieve a target conversion. Fig. 1. 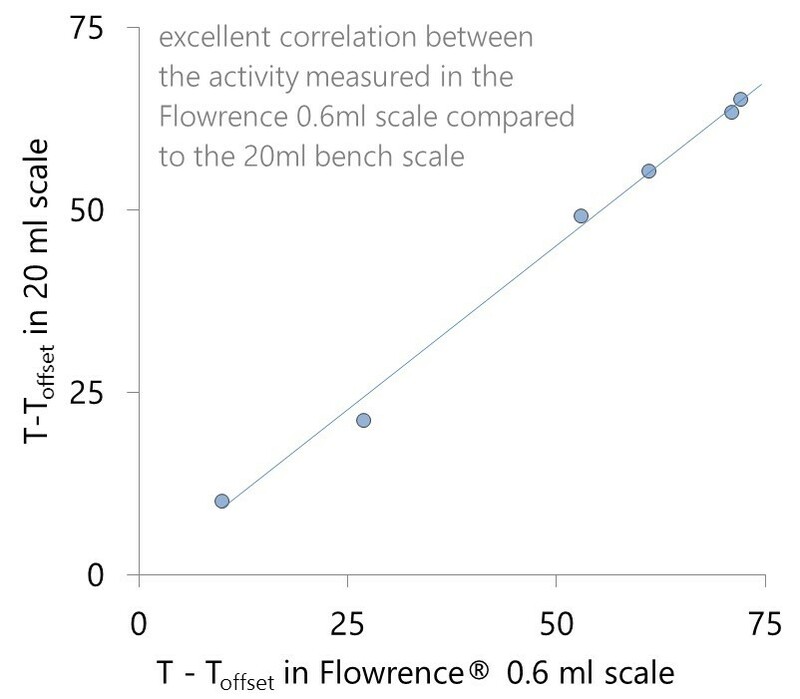 Trequired – Toffset (°F) to reach 65% conversion, 20 ml reactor vs Flowrence®.